The Audition from Stitchy Bear stamps. I printed them all out & made a border using a Martha Stewart punch. 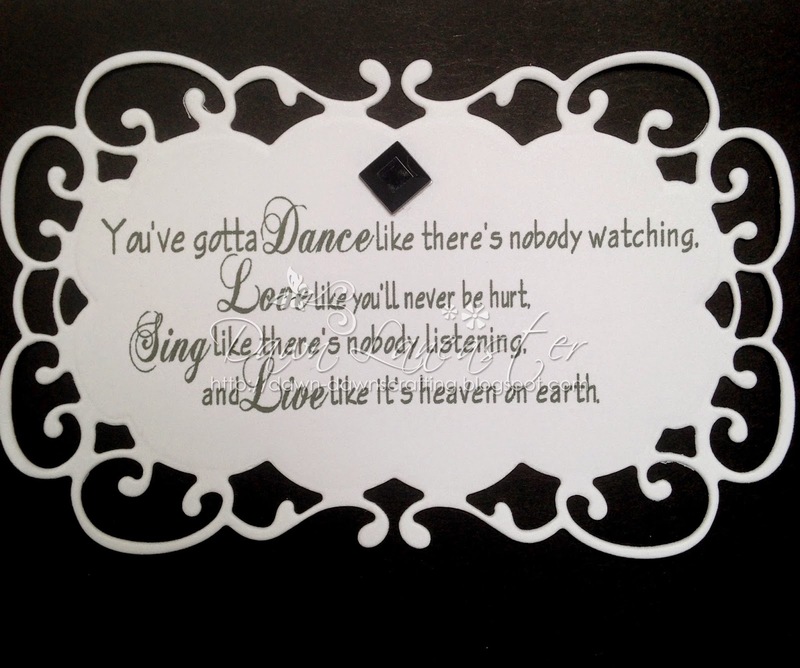 Tiny Dancer, to myself! I do love that song! I created the sentiment, a well known quotation, in my graphics program. I cut it out with a Marianne Creatables Die (one of my faves). Thanks for stopping by! I hope you can play along in the challenge. 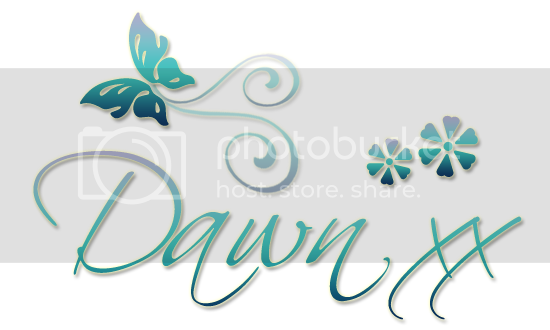 Stunning Dawn, I love monochrome and I love the beautiful sentiment. Love the mono, perfect for the 'Tiny Dancer's'...very sweet..
Oh that's so lovely Dawn . Love black and white. Also sing loudly whilst crafting in the attic !! Just gorgeous Dawn. Loving the black and white and the beautiful wording. WOW!!! 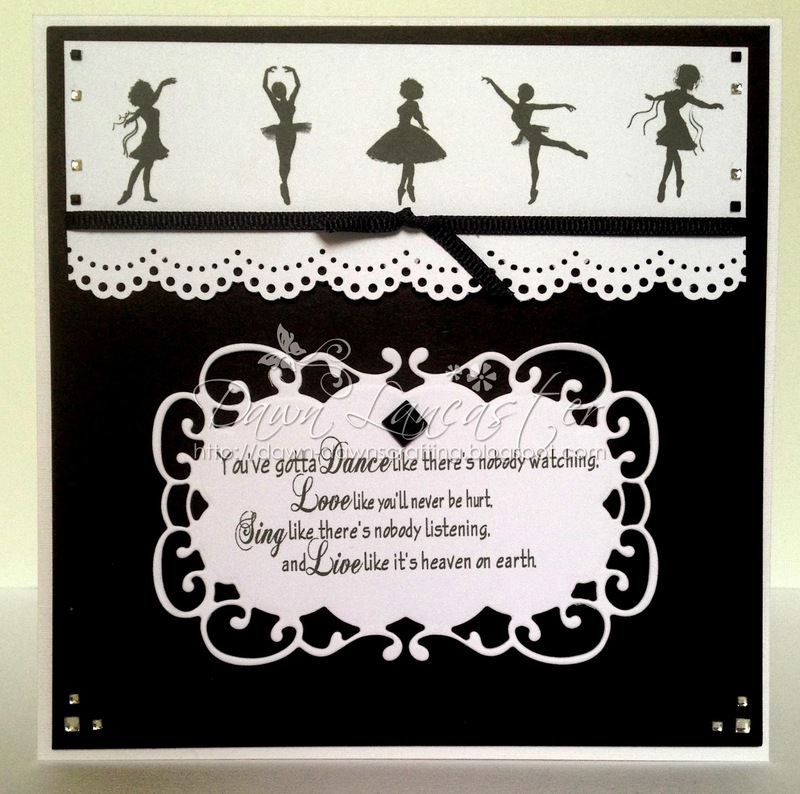 Fantastic card, love the monochrome, your tiny dancers and sentiment. Thank you for joining us this week at HIMCR. 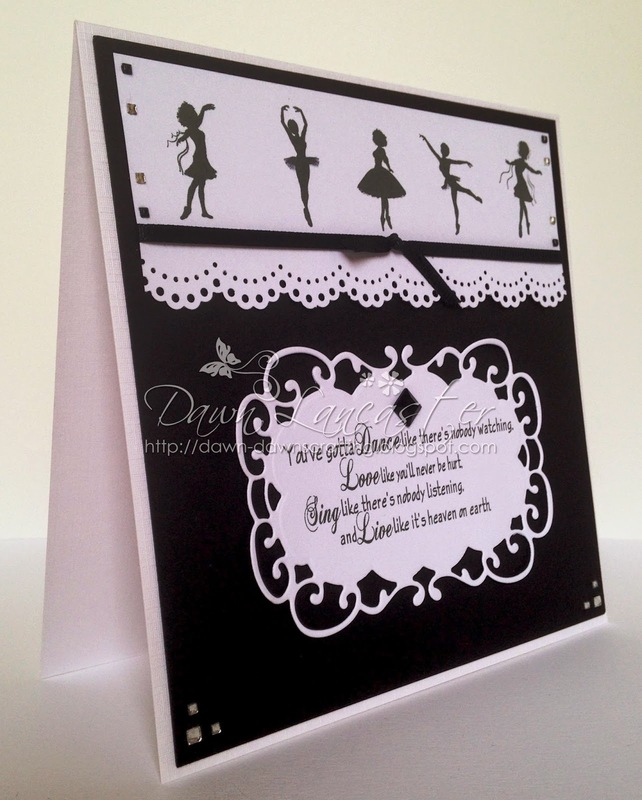 This is such an elegant card Dawn, I love the black and white combination and lovely sentiment. Thanks for playing with us this week at Delightful Challenges Anything Goes challenge! This is such a fun creation!! Hope to see your work in our next challenge! Thanks for playing in our "Monochromatic" Challenge #97! Wonderful project...TF joining us @ CIO hope you stop by again real soon. Great monochromatic card. Love the images and the sentiment together. Terrific. So glad you joined us at Die Cut Divas. Beautiful! Love the black and white contrast ~ always so elegant. This is just lovely. You can't go wrong with B&W. So kind of you to give us a video tutee too. Thanks for playing along with the Simply Create Too challenge no. 68, Mono Madness. Please join us again soon.